Tennessee’s AD is permitted to attend all football practices but isn’t permitted to coach up any of the players during his time there. 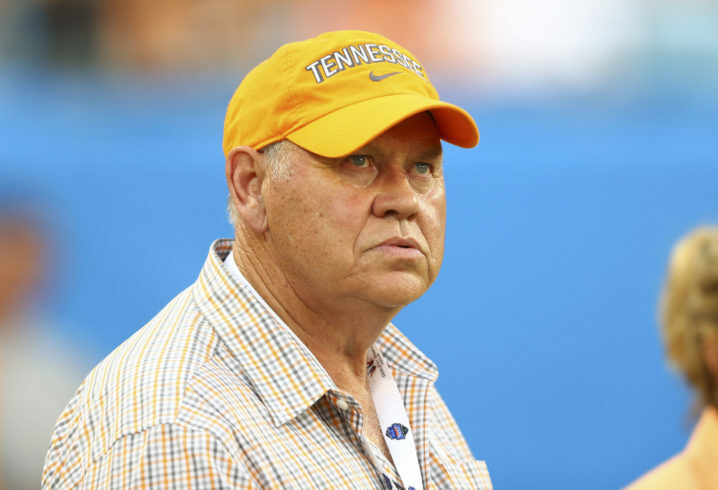 As punishment, the SEC ruled that Fulmer could not attend Tennessee practices for five days following the infraction. The Tennessee program also self-reported two other violations, both Level III in nature, for recruiting violations. 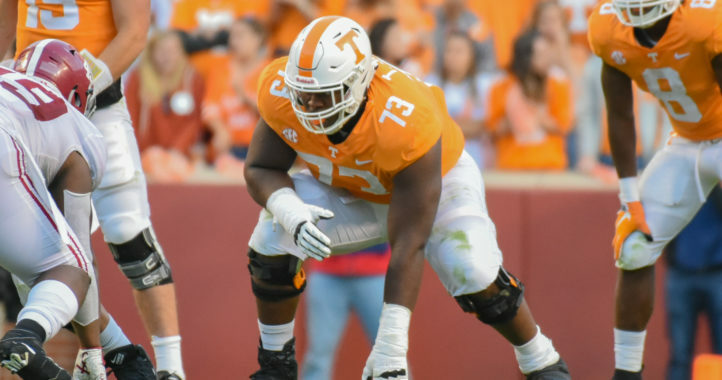 One occurred when a junior college prospect had an interaction with a coach on Tennessee’s campus before he was qualified to do so and another came when a member of the staff called the father of a recruit during a time before he was permitted to do so. Tennessee has already been punished for these violations, and no other penalties will be enforced following these three Level III violations. I wonder how long Pruitt will tolerate still being the assistant coach? If he can upset Auburn as an assistant, imagine what he can do as the head coach! Why are you so worried about Tennessee and what they’re doing? From all indications, he’s glad to have him around. Fulmer doesn’t loom over him like Trump did Clinton during the debates. He gives his full support and lets Pruitt run the show. However he was a head coach and I’m sure it’s difficult not to want to help whenever possible. There are many who would love to believe that Pruitt is just a puppet and Fulmer is always second guessing him. It makes for a good story. Having a relative that works in the athletic department that assures me that Fulmer isn’t trying to run things leads me to believe just that. If Pruitt can continue to build Tennessee into a winning program, then all should be well. But if Tennessee struggles, especially in the 2020-2021 seasons and especially if Florida really takes off under Mullen, the egos of Pruitt and Fulmer could collide. I’m not sure Fulmer can contain himself if he continually sees weaknesses in the football program. It’s going to be tough. Fulmer still wants to coach. Pruitt will right the ship if he keeps his hand out of the cookie jar. I think you’d need more evidence than what was presented here before that becomes a genuine concern. That’s fair. But my opinion is based on other reportings as well. In the end, just speculation. We really micromanage the heck out of this game, don’t we? So Phil helped out for about 30 seconds with the offensive line. It didn’t help a lick apparently AND we self-reported a level 3 violation. Sigh. If Phil is gonna cheat, he’s gonna have to work harder. Come on, Phil! What happened to workin’ like heck!? Level 3 violations happen frequently and mean nothing. Every team self-reports these every year. 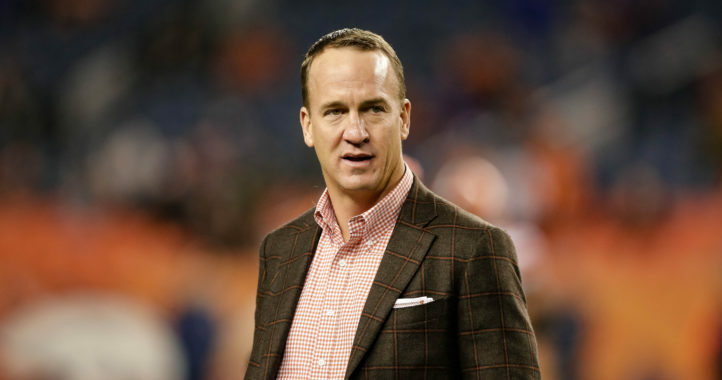 This isn’t a newsworthy item, but it’s being portrayed as such because we’re in the offseason. Level 3 is nothing but I believe it’s being talked about here because he is “coaching”. That was one of the questions before about Fulmer. Is he going to leave Pruitt alone? For how many seconds did he coach? Was it not self-reported? Is there other evidence that such “coaching” is occurring? If that’s the purpose of the article, then it’s insinuating a different story than shown in the evidence above. The “begging the question” fallacy. What does any of that have to do with what I said? They reported it which proves he coached right? Why does the AD need to coach at all if he trusts his HC?…. It matters because you and the author are making the logical leap of giving a tip to 2 players at a position he played with him regularly coaching in lieu of Pruitt and there being some level of controversy. While evidence exists as to the former, neither of you provided evidence (even so much as anecdotal) supporting the latter. You claim you’re not saying he’s doing that, but then claim there’s a narrative that he is. A narrative which has no evidence. When Fulmer hired Pruitt all the talking heads were questioning if he would let Pruitt run it his way or get involved… Reporting a Violation for him coaching is evidence that he is doing what? Coaching right?…. Like I said above it may not be anything more than that specific time but it feeds to the questions that were being thrown around when he hired Pruitt..
And again you’re making the logical leap from 30 seconds of tips to 2 players in a singular position to the argument of material involvement, which is what the talking heads were debating (an argument of conjecture). If you can’t understand what a false equivalency fallacy is, then we really have no basis for debate here. Strawman fallacy-I’m not saying he didn’t provide tips. We’re debating the larger narrative you bring up of material involvement in coaching. Your argument is a weak logical leap, relying on substance over form, vis a vis the fact the he provided coaching for 30 seconds somehow corroborates a narrative that he’s more involved. Since that can’t be proven-you’ve backtracked to now say we’re debating the facts of the self-reported violation, which isn’t something I’ve disputed in my comments. You can keep saying strawman fallacy over and over but it doesn’t disprove anything…. Do you have proof he isn’t involved? Reporting the violation is proof he has been involved… To what extent we don’t really know but you’re arguing against something reported by the school with nothing…. He has been involved. The argument of the narrative you spoke of earlier is that he’s materially involved-which you continuously fail to address. This is the argument I’m disputing and there’s no evidence that he’s materially involved by virtue of being involved in one self-reported incident which the university and ncaa agree is minor. This admittedly minor evidence doesn’t support the “narrative” argument that he’s materially involved. It merely indicates immaterial involvement. If you’re supporting the narrative of larger involvement, then it’s your responsibility to provide evidence exists. You keep saying materially involved… Do you mean material participation?…. This is the first report of violations since Pruitt was hired… Its kind of hard to set a pattern or determine if something is happening continuously without being involved with the program. Just like you don’t know it’s not going on.. That being said there is proof it’s happened right? the only people squawking about Phil coaching, meddling or otherwise leaving Pruitt alone were the people on these boards…never heard any talking head or read any article questioning otherwise…please produce! You can’t link sites on SDS… That being said just google will Fulmer interfere with Pruitt…. It will produce plenty of articles which shows you’re clueless.. The pedantic nature of a government enforced monopoly that regularly deprives young men of millions in earnings is highly ironic and hypocritical, to say the least. Wouldn’t want the NFL to have to pay for the free farm league that is college football. Doesn’t care? I think fans of UNC (probation, postseason bans, scholarship reductions), and Penn State (the same, only moreso, plus vacated wins, fines, etc.) would vehemently disagree. Yeah, let’s get rid of athletic scholarships all together. Turn back the clock! That will show them! I’m sure the Universities, NFL, and thousands of underprivileged kids who want be able to earn a college degree and better their lives will all be better off. Evil NCAA! That’s a strawman fallacy that doesn’t begin to represent my argument. As you’ll note if you read my comment, I clearly mention pro capable players, which is largely limited to “one and done” basketball players. Where in this argument do I say that no scholarships should exist? Scream strawman fallacy all you want it doesn’t change the fact that you’re a dumba$$..
You can’t even stick to football on a football article. Moron. You seem to think the NCAA is the only one that benefits from the current environment. The so-called victims of servitude have the best trainers, healthcare, education, and facilities that money can buy. Not to mention insurance policies worth millions…paid by the Universities. They are receiving hundreds of thousands of dollars worth of benefits and direct pay. As far as the one and done…that is a sham. But it’s not the NCAA’s fault. The NBPA selfishly pushed that rule to protect current members. The NCAA has no authority to tell the NBA who they can and can’t employ. Did I state only the NCAA benefitted? At what point are you going to argue the points I make and debate those directly? With regard to the one and done, I didn’t see the NCAA or anyone else associated with it reject or disagree with the NBA’s ruling. They didn’t because they benefit greatly from this decision by retaining star power for at least 1 year. The NBA also perpetuates the lie that these kids actually learn within that one year. MLB seems to work well with the farm team system. Difference is, that MLB and MILB are paying all the bills for their farm league and those players are EMPLOYEES who get paid for their efforts while developing their skills. In football and basketball though, the NCAA is more than happy to be the farm league for the NFL and NBA due to the massive revenue that it generates. Problem is that the NCAA has to keep these kids in “amateur” status and in servitude, otherwise the hypocrisy of the whole business model breaks down and the business itself won’t be far behind. When that happens, the NFL and NBA will figure out a way to have a farm league, kids who want to get paid will join up and develop their skills. The NCAA will experience a huge contraction and correction in their arrogance, and the entire sport-both professional and college will get better as a result. Also I’m thinking of changing my screen name to Strawman Fallacy.